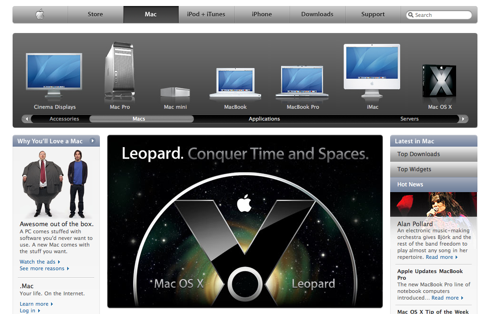 Along with today’s exciting announcements, Apple has redesigned their entire website, to shed its old “gray-lined theme” and opening it up to a new streamlined theme that reflects much of Leopard’s new iTunes-7-esque user-interface. The new website also includes some Coverflow-esque navigation and some AJAX-implementation. The new look is excellent!